Climbing hydrangea, or hydrangea anomala petiolaris by its Latin name, is a profusely flowering deciduous shrub with an additional feature that sets it apart from other hydrangea cultivars. The name says it all – unlike other species and cultivars of hydrangea, this subspecies of hydrangea anomala has the ability to climb up a wall, fence, tree or pergola. In case it finds nothing to hold on to, it will act as a ground cover. This means that cllimbing hydrangea can also be used as to cover a fence or lattice, creating a rather unique hedging alternative. The shrub’s ability to climb makes also it a perfect choice for a shady north-facing wall, as it can be positioned in anything from full sun to deep shade without affecting flowering quality. The only downside to planting climbing hydrangea in a sunny position is that the flowers will not last as long as they would in part to full shade. It will grow where little else will grow, which mitigates one of the plant’s main disadvantages – it is very slow to establish, as it may take several years for the plants to really get started. Once they are established, their annual growth rate is somewhere between 25-50cm, which is very decent. 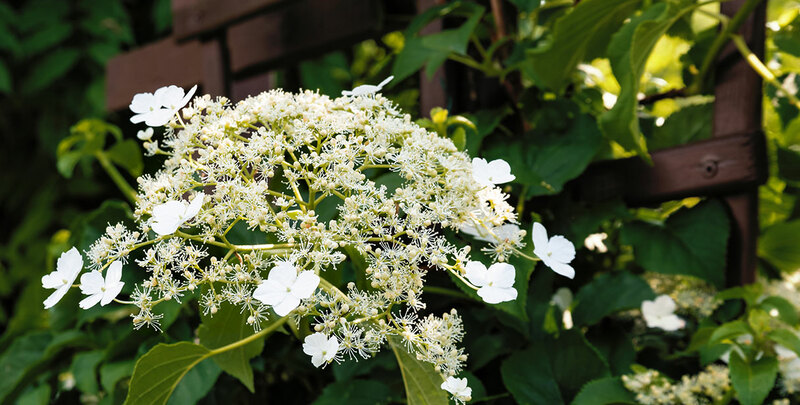 The lovely blooms definitely make it worth the wait: climbing hydrangea is covered completely with white flowers from June to August, lightening up shady corners while the rest of the garden bathes in sun. The backdrop of the lush white flowers is made up of heart-shaped dark-green leaves, turning yellow in autumn, adding some autumn interest to the garden. Climbing hydrangeas are fully hardy, very low maintenance (no pruning required to keep them in check) and will thrive in a vast array of soils, ranging from clay to sand and from acidic to neutral, but it is not too happy growing in alkaline, chalky soils. Waterlogged soils should be avoided or treated. Optional prunings should be carried out in late autumn or early spring to ensure flowering, as the flowers appear only on last year’s wood.